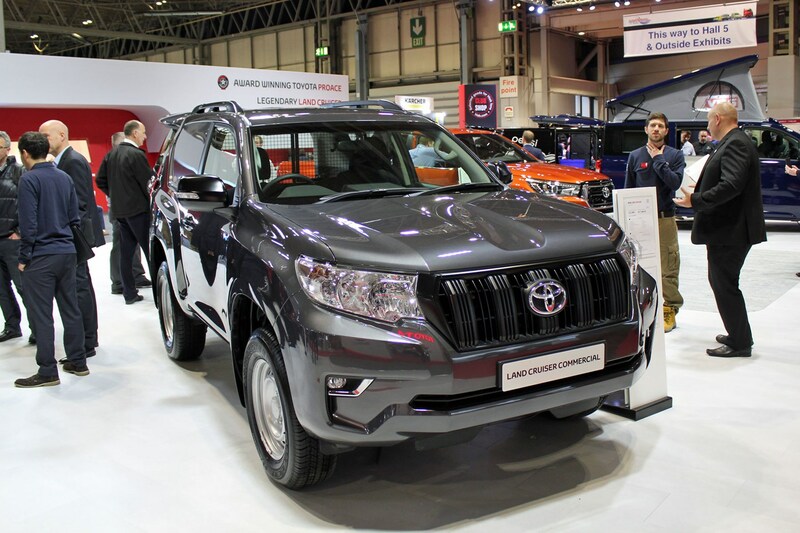 We have now driven Toyota's Land Cruiser 4x4 commercial vehicle, which has just gone on sale for the first time ever in the UK. For our first review impressions click here to whisked straight to the bottom of this page, where you can read all about the driving experience. 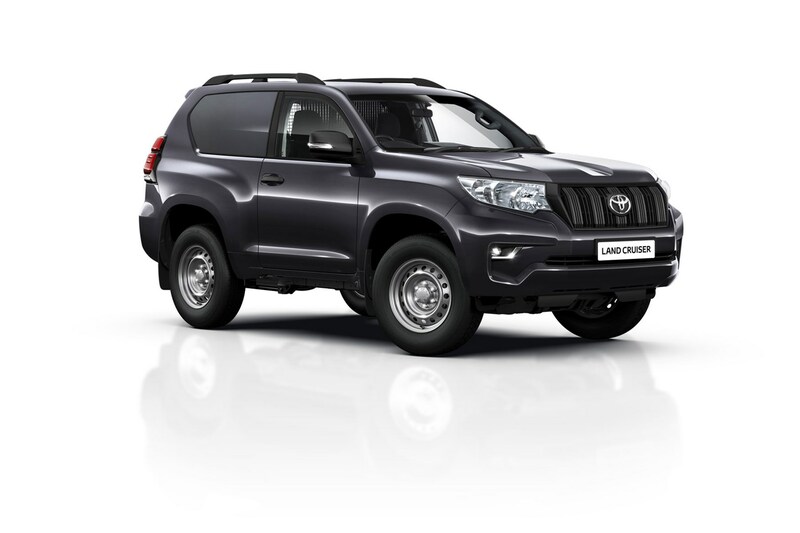 Officially called the Land Cruiser Utility Commercial, the van is available in three- and five-door guises, and becomes the cheapest version on sale of this big, practical SUV. The move is part of a wider 2018 update for this long-running Toyota 4x4, including revised styling and an updated interior. But the new Land Cruiser Utility Commercial van model may represent the closest thing to the now discontinued Land Rover Defender you can currently get your hands on. 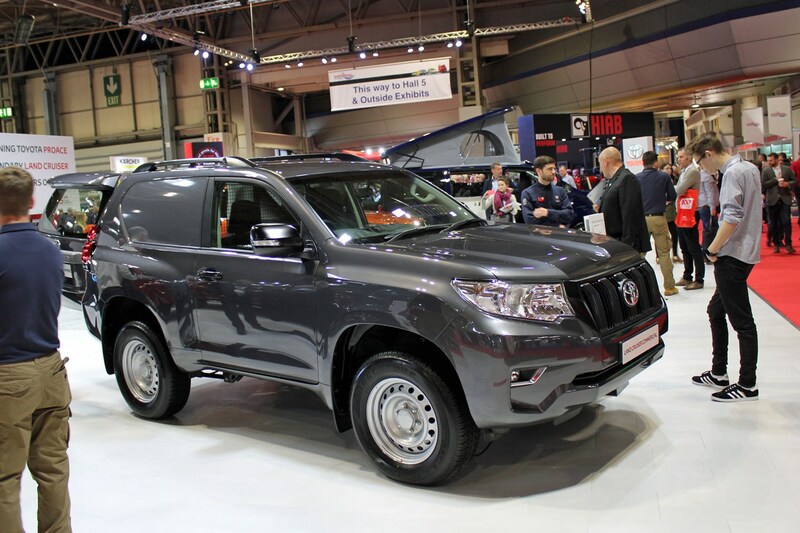 The new Land Cruiser Utility Commercial made its UK debut at the CV Show 2018, where it appeared in SWB three-door form alongside the latest additions to the Hilux pickup range, the AT35 and the Invincible X. 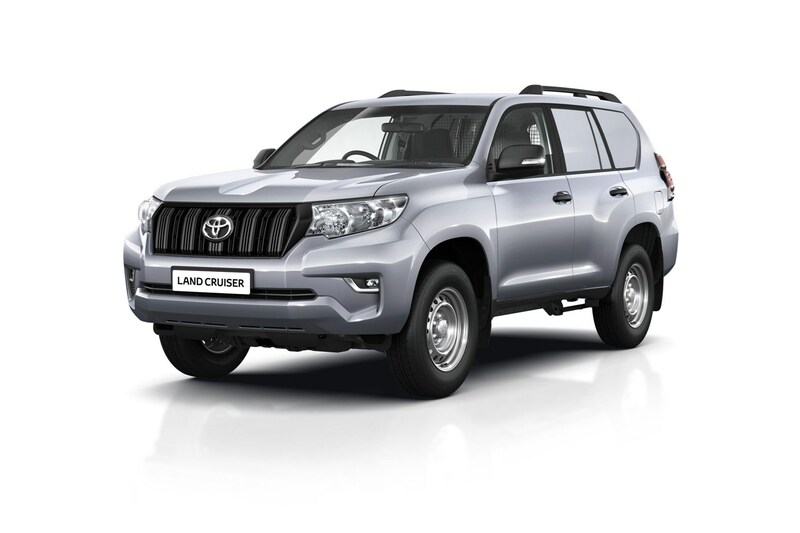 As with all 2018 Land Cruisers, the Utility Commercial version is powered by a 2.8-litre D-4D four-cylinder turbodiesel engine. This produces 177hp and 420Nm of torque in the three-door short-wheelbase (SWB) variant, rising to 450Nm in the five-door long-wheelbase (LWB) variant. That's more power and torque than the latest generation of Toyota Hilux, which uses a 2.4-litre engine. This will certainly make the Land Cruiser feel faster on the road; something the Hilux certainly isn't. The Utility Commercial model still needs 12.1 seconds to go 0-62mph, which although faster than the regular passenger versions is hardly even brisk these days; a V6-powered VW Amarok will leave it for dust. Top speed is 108mph. Claimed fuel economy is 38.1mpg, but we suspect you'll be lucky to crack 30mpg in reality. Both versions are fitted with a six-speed manual gearbox. Will the Land Cruiser Commercial Utility be good off road? The Land Cruiser’s legendary permanent four-wheel drive system comes as standard, complete with Torsen limited-slip centre differential and a 'shift actuator' that makes it easier to switch between high and low range gearing - the latter improving control and performance when going properly cross country. Helping further with this, Toyota says the Land Cruiser's bumpers (front and rear) and the crossmembers on its ladder frame chassis have been specially designed to slide over obstables, rather than get stuck on them. 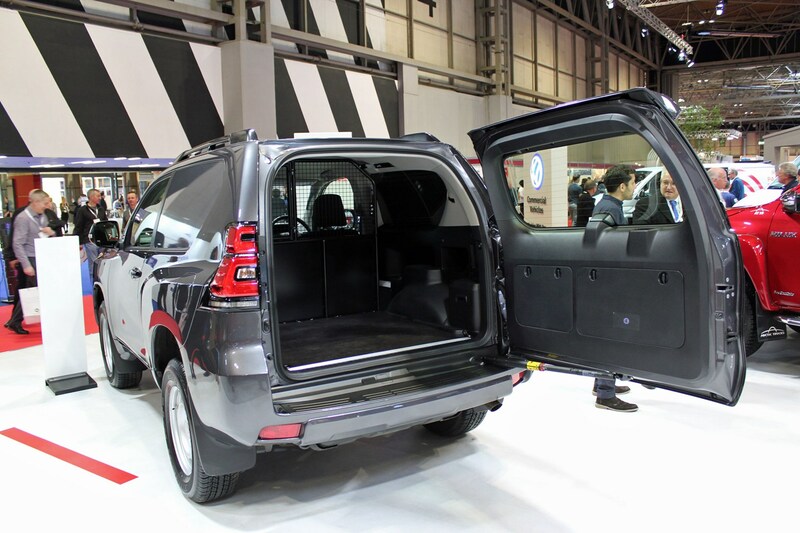 As you'd expect for a van variant, the rear seats of both versions have been removed to make more room for stuff. While we're still waiting for full load area dimensions, Toyota has confirmed the the SWB now offers 1,574 litres of space (just under 1.6 cubic metres) and the LWB 2,216 litres (just over 2.2 cubic metres). 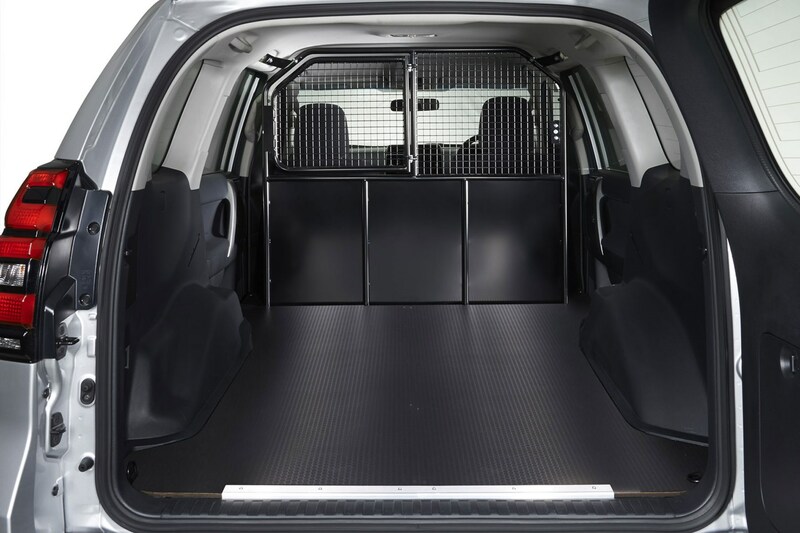 The load area is fully lined with a flat, non-slip tray, and you get a full bulkhead as standard - part solid metal, part 'strong' mesh with an access hatch. The rear windows are blanked panels, painted the same colour as the rest of the bodywork. The rear side doors of the five-door version still open. Gross vehicle weight (GVW) is 2,600kg for the SWB, 2,930kg for the LWB. Payload ranges from 488 to 593kg for the SWB, and 661-756kg for the LWB. Both versions can tow up to 3.0 tonnes (3,000kg) braked, or the usual 750kg unbraked. Perhaps worth noting that the Hilux out-performs the Land Cruiser for both payload and towing; carrying up to 1,130kg, even in double cab specification, and towing up to 3.5 tonnes. LWB models also get an aux-in and USB connection. Pricing for the new Land Cruiser Utility Commercial starts at £27,546 for the SWB model and £28,509 for the LWB model, and it went on sale in April 2018. First customer deliveries are scheduled for July 2018. We’ll bring you a full review from a properly extensive drive shortly, but we have now covered a few miles at the wheel of a short-wheelbase Land Cruiser Utility Commercial during a recent car industry test day – enough to give you some guidance about whether this new commercial 4x4 might be for you. If you’re considering one of these as a replacement for an aging Land Rover Defender, the first thing that’s going to grab you is how comparatively luxurious the cabin is in the Toyota. The seats are comfortable, the controls are sensibly positioned, and the unfussy dashboard is finished in high quality durable plastic. We were also struck be the total absence of any unpleasant smells inside. This might sound like a funny thing to say, but in some rival SUV-based commercial vehicle conversions, the rubber material used to line the load area reeks something terrible when they’re brand new. This Land Cruiser is not afflicted by this at all – we’d happily have immediately set off on a long-distance jaunt. The thought of long distances immediately brings us onto Toyota’s suspension – which is far more cushy and pleasant than you’d experience in a working pickup. And that’s in this SWB version, which we fully expect to feel choppier than its bigger brother; the LWB model should be able to smooth out lumps and bumps more effectively thanks to the increased distance between its front and rear axles. This is not to say the Land Cruiser Commercial is as comfy as a conventional passenger car – it still jiggles about a bit over broken surfaces – but with those big balloon tyres and the amount of suspension articulation that promises to make it an exceptional off-road, it really isn’t unpleasant at all. Again, if you’re coming from a Defender this will be a revelation. More familiar to Defender drivers will be the gearshift action of the Land Cruiser’s six-speed manual gearbox. It’s not exactly recalcitrant, but the floor-mounted lever feels like it’s about three feet long and selecting gears can be a vague exercise – to the point where it seems more like stirring a stew than operating something mechanical. The steering is better – certainly than the Land Rover’s – but favours easy assistance over precision, so you won’t be chasing too many hot hatchbacks down country lanes. Something you’ll quickly discover the bodyroll generated by the soft suspension will actively discourage as well. The engine, on the other hand, feels more than up for the challenge. What’s the Toyota Land Cruiser Commercial’s engine like then? As with all 2018 Land Cruisers, the Commercial version is powered by a 177hp 2.8-litre D-4D turbodiesel engine – that’s a lot of cylinder capacity for a four-cylinder motor, which results in a pretty stonking feeling of torque from the barest amount of revs. The quoted 12.1 second 0-62mph time doesn’t really do the experience justice. It’s not especially quick off the line – a short-ish first gear compounding this – but once you’re moving, accelerating in-gear is a properly pleasing experience. The one we were driving was completely empty, which probably increased this sensation; the Commercial model is significantly lighter than the equivalent passenger Land Cruiser. But even at motorway speeds this is a decidedly more potent machine than the contemporary Toyota Hilux. In fact, since we were at a private test facility with a high-speed area, we found the Land Cruiser comfortably propelled itself up to an indicated 100mph with very little effort. The official top speed is 108mph. Refinement is more than acceptable, with little wind noise and no obvious vibration in the cabin. What’s the Land Cruiser Commerical like off-road? Sadly, we weren’t given the opportunity to test this aspect of the vehicle just yet – but suffice to say the Land Cruiser in general has an excellent reputation in this area, so we’re fully expecting it to be a very decent off-road performer. The permanently engaged four-wheel drive system has a torque-sensing limited-slip centre differential and a low-range setting for particularly tricky terrain. So if you need a vehicle to service inhospitably located work sites, this should be a very solid choice. Obviously, we’d like to spend a lot longer behind the wheel before making a final judgement, but on the evidence of this brief first encounter, the Land Cruiser Utility Commerical is shaping up to be a force to be reckoned with in the – admittedly limited – commercial 4x4 sector. From the exceptionally neatly finished load area conversion to the hassle-free driving experience, it promises to make life with a properly off-road-capable machine surprisingly pleasant. To the point where we wonder whether the biggest problem for Toyota may be the impact on sales of the Hilux – though perhaps the two suit different customers. More on the Toyota Land Cruiser Commercial soon.